Riotous protesters briefly stormed the Cameroonian Embassies in Paris and Berlin over the weekend in an attempt to raise global awareness about the rolling regime change campaign back in their homeland following the reelection of President Biya to his seventh consecutive term in office late last year, possibly forcing France to choose sides in decisively throwing its weight behind either its decades-long proxy or his anti-government opponents. Most of the global media didn’t pay much attention to it but anti-government protesters briefly stormed the Cameroonian Embassies in Paris and Berlin over the weekend in an attempt to raise awareness about the rolling regime change campaign against their country’s long-serving president, who was just re-elected to his seventh consecutive term in office late last year. The West-Central African country is currently experiencing a pronounced bout of Hybrid War unrest whereby it’s suffering asymmetrical onslaughts from Anglophone separatists and Boko Haram Islamists while simultaneously having to fend off a simmering Color Revolution movement. The so-called “perfect storm” is brewing, but it hasn’t yet attracted the serious focus of any Great Power mostly because President Biya remains immensely loyal to his French patrons in spite of his Silk Road partnership with China, though the latest attention-grabbing tactic is trying to change all of that. While the case can be made that the Hybrid War on Cameroon is designed to achieve the dual objectives of disrupting China’s future transcontinental Silk Road in the region (Sudan-Chad-Cameroon) and creating the conditions where the rising African Great Power of neighboring Nigeria can be more easily controlled, no Great Power has yet to throw its full weight (even just diplomatically) behind this destabilization campaign. This suggests that it might either be a “work in progress”, a “probe” intended to gauge the resiliency of regional security structures, or a short-term pressure tactic that aims to coerce certain political concessions out of Yaoundé. There’s also the chance that a large degree of these Hybrid War processes are “naturally occurring” outcomes of the ultra-diverse country’s identity fault lines finally colliding with one another. Whatever the case may be, some members of the diaspora are clearly eager to shape the situation to their favor. 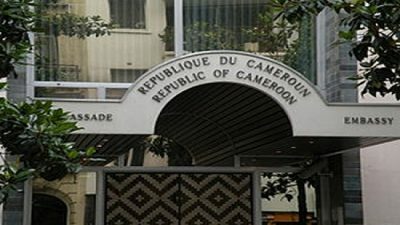 The coordinated storming of two of a nation’s embassies over the weekend would ordinarily be a global media event but wasn’t in the case of Cameroon because the country is a medium-sized African state whose diplomats aren’t afforded much respect in the West. Had this happened to a Great Power such as France, however, the reaction would be altogether different, though the “silver lining” in this instance is that this attention-grabbing provocation has yet to get any of the Great Powers to publicly throw their weight behind the rolling regime change operation that the protesters are in support of. That might soon change, however, if the ongoing destabilization of the nation’s largest port of Douala interferes with Chad and the Central African Republic’s imports from there, possibly impeding them and therefore raising the cost everything else in those countries as a precursor to a socio-economic crisis in each landlocked state. The Central African Republic (CAR) has recently come under heavy Russian influence after Moscow received UNSC approval in late-2017 to dispatch “mercenaries” there as part of a train-and-assist program for buffeting the anti-militant capabilities of the country’s fledgling military as the central state seeks to restore its sovereignty over the rest of its mineral-rich territory. As for Chad, it periodically slips into civil war and sometimes has to fend off foreign-based militants from Sudan and Libya, but it’s nevertheless still a regional military power with impressive reach that extends as far westward as Mali. Of interest, N’Djamena recently restored relations with Tel Aviv following Netanyahu’s visit there last week, which contributed to the interesting state of regional affairs where one Central African state (Chad) is under “Israeli” influence, another (CAR) recently came under Russian influence, and the third (Cameroon) is under Chinese influence despite all three informally being part of Paris’ neocolonial Françafrique. Although France still controls each of their currencies and almost a dozen other African countries’ through the CFA franc, it’s slowly but surely losing geopolitical influence in its former colonial domain. Fretful that it won’t be able to regain its formerly strategic position in the CAR after Russia moved in there to help stabilize the situation, and possibly even Gabon as well following the US’ dispatch of troops there earlier this month before the country’s failed coup attempt, France might feel compelled for now to cling to its partner in Cameroon despite the growing “grassroots” pressure for it to betray him. That said, if the situation appears to be moving in the direction where a regime change seems “inevitable”, then Paris could be expected to turn on its proxy in a last-ditch attempt to save its influence there instead of having the country fall under American or British influence if France hasn’t prepared a replacement for him. Is It Now Or Never For Françafrique? Just like the Ottoman Empire was regarded as the “sick man of Europe” for some time prior to its collapse, so too might France come to be seen as the “sick man of Africa” if its Françafrique holdings continue to fall under the sway of other powers. The CFA franc might not go anywhere soon, but France’s geopolitical dominance over this transregional space might slip away if the country can’t regain control over its proxies after Russia’s recent advances in the CAR, Chad’s outreach to “Israel”, and Gabon’s surprise hosting of US troops. China’s influence is also looming large all throughout Françafrique and Paris might soon feel pressured make a stand in Central Africa by either decisively supporting or opposing the Cameroonian President depending on which way it feels that the “wind is blowing”. Be that as it may, last weekend’s Cameroonian embassy stormings might force France to finally make a choice one way or the other.